Conor McGregor tarnished the UFC brand when he was recorded on video throwing a trolley at a bus carrying UFC fighters last week. 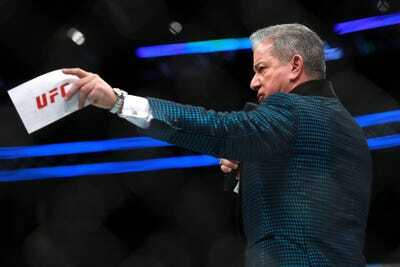 That’s according to UFC announcer Bruce Buffer, who said he is “horrified” by the incident. Conor McGregor tarnished the UFC brand when he was recorded on video throwing a trolley at a bus carrying UFC fighters, according to UFC announcer Bruce Buffer. McGregor, a former two-time UFC world champion, reportedly stormed a UFC press conference in New York City last week, then attacked a team bus and smashed a window leaving two athletes requiring hospital treatment. A New York Police Department spokesman confirmed to Business Insider that McGregor was charged with three counts of assault and one count of criminal mischief when he turned himself in to the 78th precinct in Brooklyn. Buffer condemned McGregor and said he “s*** on all of us”in an interview with TMZ Sports. The attack left two fighters – Michael Chiesa and Ray Borg – requiring medical treatment. Borg suffered an eye injury from shattered glass, while Chiesa suffered multiple cuts to the face, according to MMAFighting journalist Ariel Helwani. McGregor has been widely criticised from senior figures in combat sports. UFC commentator Joe Rogan said “it’s pathetic” and “it’s disgusting” when he was on-air, commentating at UFC 223, on Fox Sports 1 on Saturday. McGregor was released on a $US50,000 bail after appearing in a New York City court on Friday. He was granted permission to travel outside the United States but has another court appearance on June 14.